Fox News normally ranks #1 among cable news channels. But lately MSNBC's Rachel Maddow has been challenging Fox at 9 p.m., the centerpiece of the prime time schedule. 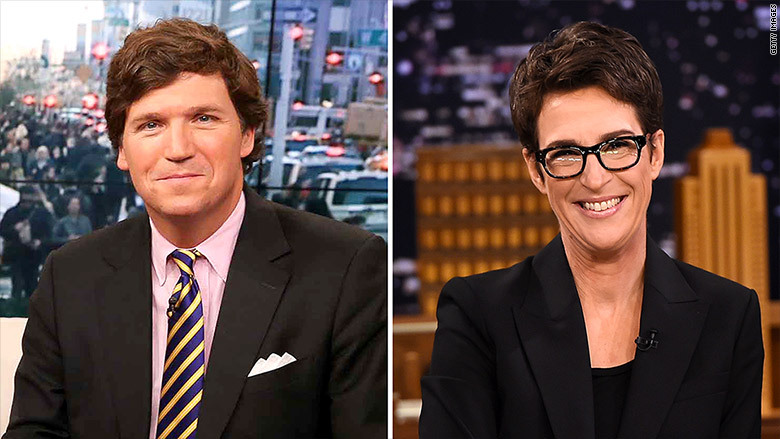 "The Rachel Maddow Show" surpassed "Tucker Carlson Tonight" in March among 25- to 54-year-old viewers, the demographic that determines advertising rates. Maddow was on track to win again in April. But on Monday night the cable news ratings race changed dramatically. Carlson moved from 9 p.m. to 8, replacing Bill O'Reilly, and Fox's 5 p.m. talk show "The Five" moved to 9. Maddow may or may not benefit from the change. Regardless, executives all across television news have already taken notice of her recent wins. According to Nielsen data, Maddow also narrowly topped Fox's 8 p.m. hour last week, when Dana Perino and Greg Gutfeld filled in for O'Reilly. Maddow's surge is being fueled partly by her day-in, day-out criticism of the Trump administration. There is an increased appetite for the liberal arguments she has been making for years. "There's a reason Rachel is beating Fox and CNN," MSNBC president Phil Griffin told CNNMoney in an email. "She's a talented storyteller who's helping her audience cut through all the confusion coming out of Washington. She's connecting dots in ways no one else is." Maddow is known for flouting the conventions of cable news. She delivers long, informative monologues that sometimes last for 20 minutes. Her fans say she's providing necessary scrutiny of the Trump administration. Her critics, on the other hand, say she's become a left-wing Sean Hannity, single-mindedly obsessed with anti-Trump stories. While those debates rage on Internet forums, the ratings speak for themselves. The week of April 10, for instance, Maddow just barely beat Carlson -- she averaged 542,000 viewers in the demo while he averaged 541,000. CNN ranked third with an average of 396,000 in the demo. Maddow's show has been MSNBC's tentpole, its highest rated program, for many years. The difference now is the competition with Fox News. 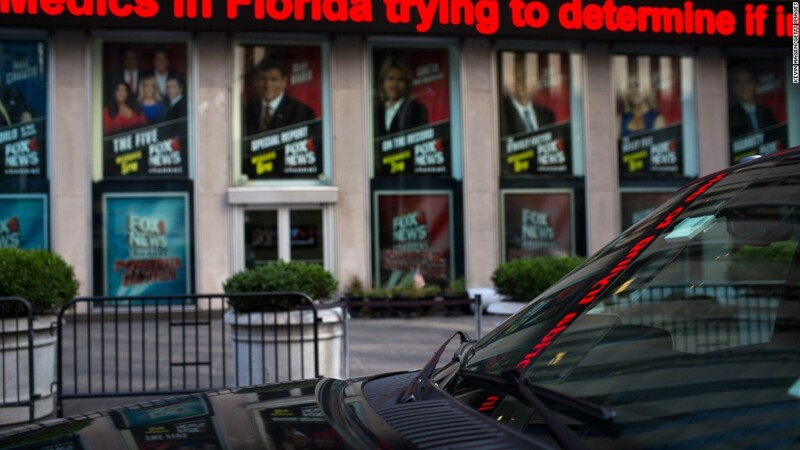 For a long time Fox's ratings were largely out of the reach of CNN and MSNBC. Megyn Kelly, who had Fox's 9 p.m. time slot until early January, was consistently #1 in the hour. Carlson took over for Kelly and retained most of Kelly's viewership. Fox has celebrated Carlson's success at 9 p.m. and cited it as part of the reason to move him to 8. The bigger picture story is that the ratings for all three cable news channels have risen thanks partly to interest in Trump's presidency. With that as the backdrop, though, Maddow has gained more than most other shows have. In recent months Maddow's primary focus has been on the Trump-Russia relationship. Her viewers seem intensely interested. Maddow has also homed in on Trump's refusal to release his taxes, and she was rewarded with record ratings on March 14 when she had a scoop about Trump's 2005 tax payments. Her numbers have sagged somewhat since then, but Maddow still out-rated Carlson in the 25-54 demo for 12 of the 20 weeknights in April, according to Nielsen. Of course, some Maddow viewers wouldn't be caught dead watching Carlson's show and vice versa. This polarization was lamented by former president Barack Obama at an event with students on Monday. "These days, you don't have to confront people if you have different opinions," Obama said on stage. "If you're liberal, you're on MSNBC. If you're conservative, you're on Fox News." Among total viewers, Fox virtually always beats other cable news channels, because the channel's audience skews older than CNN and MSNBC's audience. Carlson averages more than 3 million viewers a night. But no one knows quite will happen without O'Reilly as the cornerstone of Fox's prime time lineup. Maddow's performance will be closely watched as the O'Reilly-less era of cable news gets underway. For two decades Fox has benefited from having a relatively consistent prime time schedule. But now it's MSNBC and CNN that seem consistent while Fox is making changes. Maddow has been on at 9 p.m. for almost a decade. She initially benefited from having Keith Olbermann as a lead-in. Now Lawrence O'Donnell at 10 p.m. benefits from her. "You know, I will say I don't pretend to understand what brings people to the show," Maddow recently told Vulture's Joe Adalian. "I don't think I have more insight than anybody else into why more people are watching. But it is super gratifying to me, and everybody who works on the show, that we are just doing what we've always done. We're continuing the work we've built the capacity to do and that we really believe is the best approach for what I bring to looking at the news of the day. And it's, for whatever reason, a rewarding thing for more people."